A postage stamp’s primary purpose is to show evidence of a fee paid for postage services. A quick glance at a stamp reveals a few key elements: The denomination of the stamp, the country’s name, a graphic design, and most often text elements. Postal administrations are either a branch of government or an official monopoly under its supervision. Since stamps have both a national and international audience, a government has total control to depict itself as it would like to be perceived. Over the weekend, we did some cleaning and stumbled across my sister-in-law’s stamp collection. 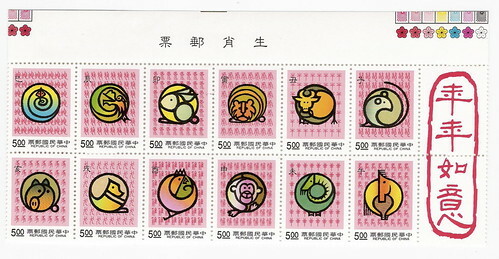 Some stamps were quite harmless and showed the beauty of Taiwan’s landscape, flora, and fauna. Others bolstered the ruling regime through showcasing its developmental success and commemoration of war. A commemoration of the Second Taiwan Strait Crisis which began on the evening of August 23, 1958 with the intense artillery shelling of the ROC controlled islands of Jinmen and Matsu. A series of national construction projects in the 1970s. These included (from upper left clockwise): The Electrification of the Western Line Railway, Taichung Port, Taoyuan (CKS) International Airport, China Steel Factory, National Highway No. 1, The North-Link Line Railway, China Shipbuilding Corporation (CSBC) Shipyard, Su-ao Port, an oil refinery and industrial park, and a nuclear power plant. 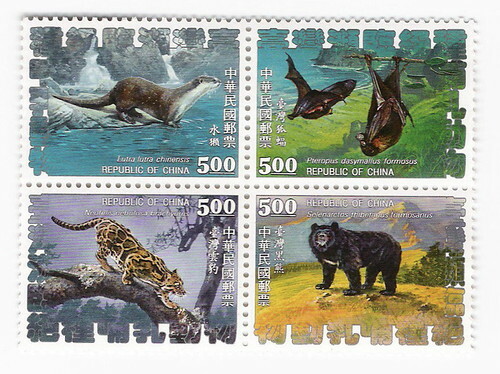 From upper left clockwise: Eurasian Otter [Lutra lutra chinensis], Formosan flying fox [Pteropus dasymallus formosus], Formosan Clouded Leopard [Neofelis nebulosa brachyurus], and Formosan Black Bear [Selenarctos thibetanus formosanus]. From left to right: Striped Slender Frog [Rana taipehensis], Narrow-mouthed Frog [Microhyla inornata], Emerald Green Tree Frog [Rhacophorus smaragdinus], Painted Chorus Frog [Microhyla butleri]. Butterflies in Taiwan – Care to check which ones I am missing? 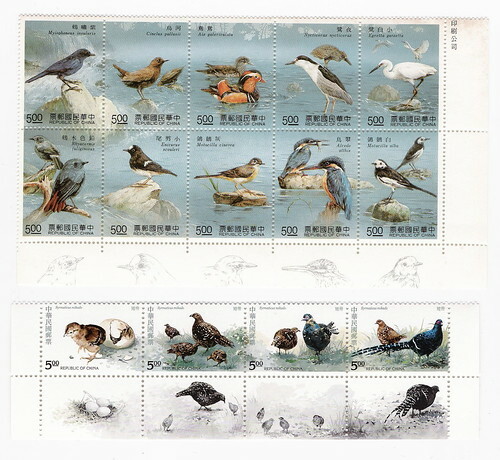 A lot of lovely specimens here – from upper left clockwise: Taiwan Whistling Thrush [Myophonus insularis], Brown Dipper [Cinclus pallasii], Mandarin Duck [Aix galericulata], Black-crowned Night Heron [Nycticorax nycticorax], Little Egret [Egretta garzetta], Plumbeous Water Redstart [Rhyacornis fuliginosa], Little Forktail [Enicurus scouleri], Grey Wagtail [Motacilla cinerea], Common Kingfisher [Alcedo atthis], White Wagtail [Motacilla alba]. That’s all for tonight, I have a couple more available in a Flickr set. If I scan anymore I will send them there. I hope everyone enjoyed this journey of geekdom with me. Thanks Criag, there are still plenty I haven’t scanned. I guess I’ll have to wait until the next rainy weekend (which will give me something to do besides photograph toys and action figures).